WORCESTER, Mass. - The Holy Cross women's hockey team dropped its first Turnpike Trophy matchup with Boston University, 4-1, Friday night at the Hart Center. Things started well for the Crusaders with Jada Brenon making 15 saves in the first period and Victoria Young snagging her second goal of the year at the end of the frame to tie things at 1-1. The Terriers got hot in the second and put three tallies on the scoreboard to take a commanding 4-1 lead. The third period was relatively quiet with both sides combining for only nine shots on goal. 1-0 BU (1st, 16:24, PP): The Terriers struck first off the stick of Hockey East's point leader, Jesse Compher. 1-1 HC (1st, 18:51, PP): The Crusaders would respond when Young sent a drive home from the point with some help from Hannah Gillis and Katie MacCuaig. 2-1 BU (2nd, 4:34, EV): The Terriers started their hot second period with a goal from Mary Grace Kelley. 3-1 BU (2nd, 8:50, EV): Alex Allan let one rip from just outside the blue line. 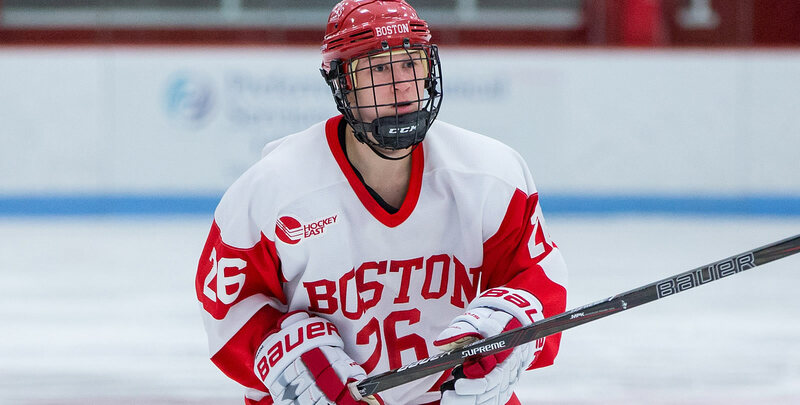 4-1 BU (2nd, 19:33, EV): Courtney Correia capped the period for BU with the Terriers' third of the frame. - Young's second goal of the season makes her the sixth Crusader to score multiple times. - Holy Cross has scored on the power play in three of its last four games. The Crusaders will be back in action tomorrow afternoon when they take on the Terriers at 3 p.m. at Walter Brown Arena in Boston.